Last Tuesday, our friend Katie came to visit. Katie and I were roommates in college and it’s accurate to say that during our first year at Georgetown we subsisted on a diet of Thomas bagels, Zatarain’s instant red beans and rice and Haribo gummy bears, and usually all of them in one sitting. Thankfully, we’ve gotten past those horrifying dietary habits, and somehow I write a food blog and Katie cooks for a restaurant. 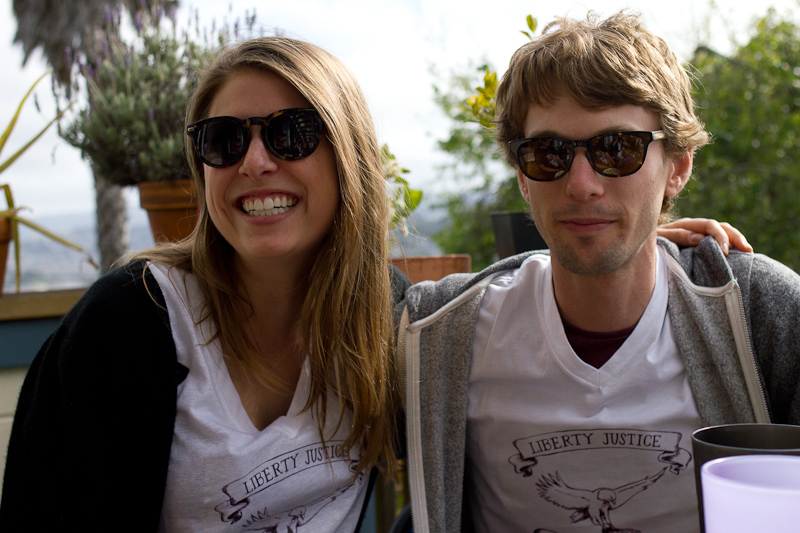 These days, Katie lives up in Boonville, CA and cooks for the Boonville Hotel. Boonville is just two hours North of San Francisco in Medocino County, but we’re not able to get together as often as the short distance would suggest. And so it’s a real good thing when I get an out-of-the-blue text from Katie saying that she’ll be in San Francisco for the day and would I be around? There is nothing I like more than having someone over for dinner, and even more someone who’s happy to just sit down, shell some beans and chat about all matter of things while I sauté up a shallot. Not everyone can dig into big and important life questions while the other person flits from stove to sink, stirring this and washing that, but Katie doesn’t seem to struggle. We’re a good match. Which brings me to pasta. This pasta comes together gracefully. 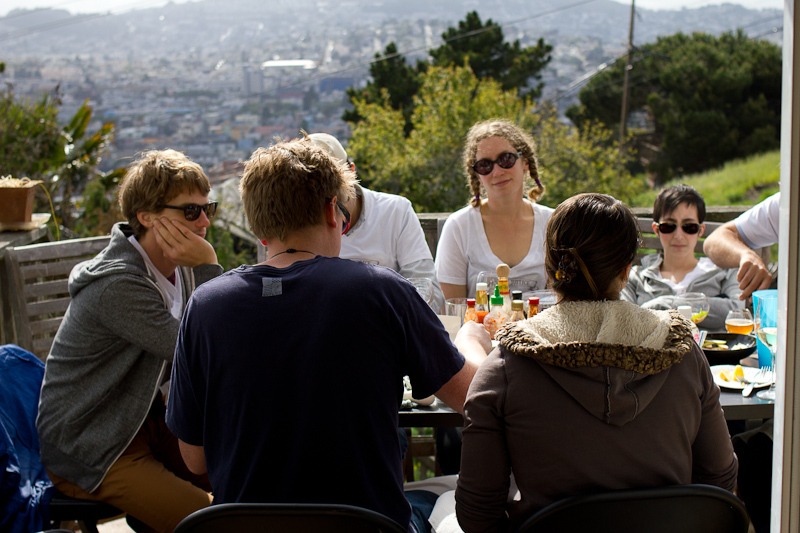 You can carry on a conversation and still put a meal on the table in about thirty minutes. There’s nothing fussy about it, but looks and tastes like you did a whole lot more work. 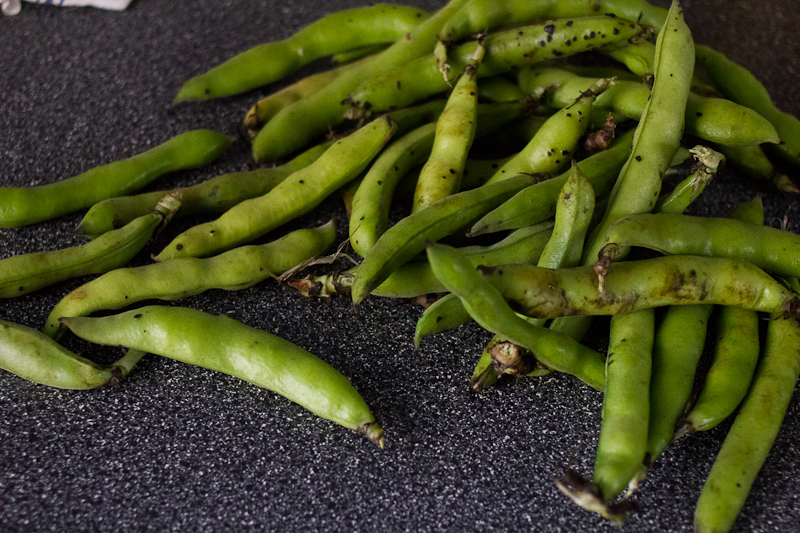 In case your market doesn’t have fava beans, you also could swap them for spring peas or asparagus cut into bite-sized pieces. I’m planning to do just that later this week. This recipe makes enough for three people as a main course. Put a pot of salted water to boil. Take the fava beans out of their pods. When the water is boiling, blanche the favas for a minute or two, until they turn bright green. Scoop them out of the hot water and into a bowl. Then peel off their outer skin. Keep the water boiling to cook the pasta in later. In a large sauté pan, melt the butter over medium-low heat. Add the shallot and sauté for a few minutes to soften. When the shallot is soft, add the favas and sauté a minute or two more. Meanwhile, add the pasta to the boiling water. Cook the pasta 2 – 5 minutes, depending on its shape. 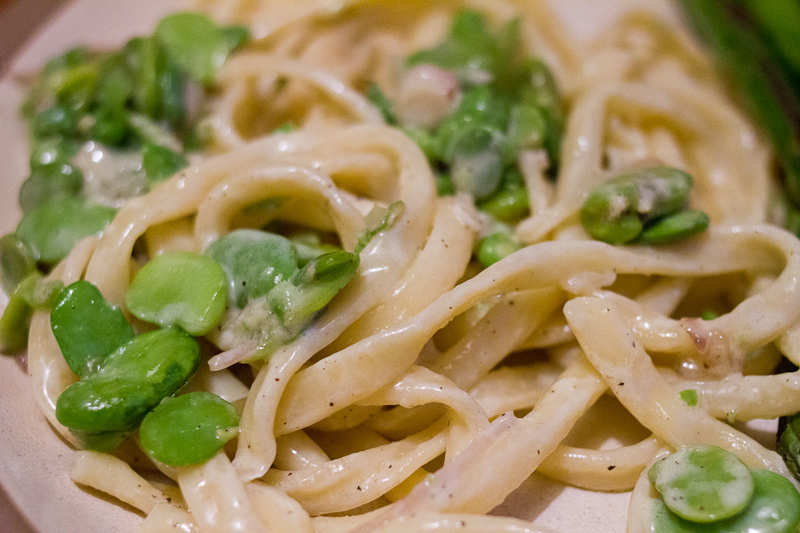 When the pasta is cooked al dente, scoop it from the water and add it to the sauté pan with the fava beans and shallot. Still over low heat, add the creme fraiche and stir to distribute. Easiest sauce ever. When it’s looking all saucy and delicious, scoop onto plates and garnish with a little grated parmesan. The first time I ever had passionfruit was at an Argentine ice cream chain called Freddo. It was my first week with my host family and my host mom Josefina took me and my host brother out for helado as a treat. She suggested I order the maracuyá and since the menu of 40+ flavors was completely overwhelming, littered words I couldn’t hope to decipher before I had to place my order, I followed her lead. I had absolutely no idea what I’d ordered, but one bite and I was hooked. Over the next year, I invested a decent amount of time testing helado de maracuyá at heladerias all over the city of Buenos Aires, while Jordan sought out the best dulce de leche granizado alongside me. After a year of diligent taste testing, Freddo, the place where I had that first fateful scoop of maracuyá, ended up on top, but we’re more than willing to continue the experiment if anyone wants to sponsor a trip. The flavor of passionfuit is heavenly. It’s in a league of it’s own—tropical, tart, sweet and totally mesmerizing. It’s not a flavor that you come across often here in the continental US, but it’s incredibly popular in Argentina and Brazil. Everything from ice cream to cakes, mousse to cocktails gets a welcome injection of tropical paradise. I decided to take a page out of that playbook for this dessert. 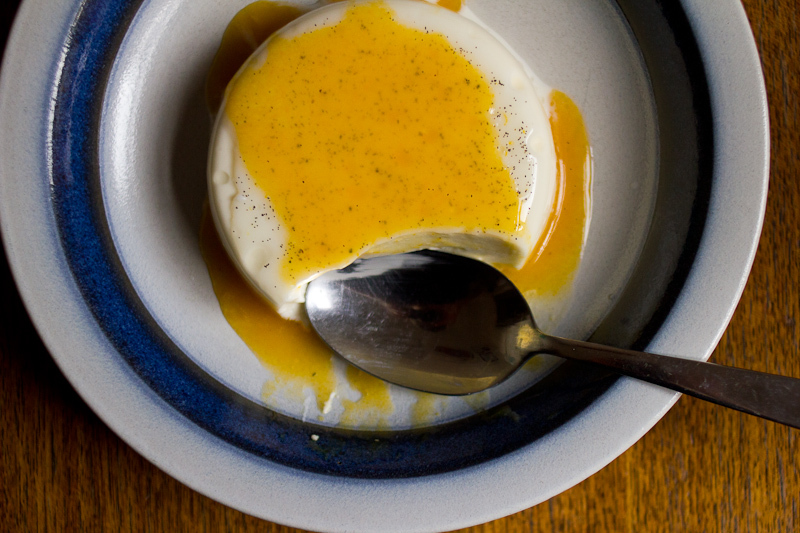 The combination of milky custard with sweet-tart passionfruit is phenomenal. 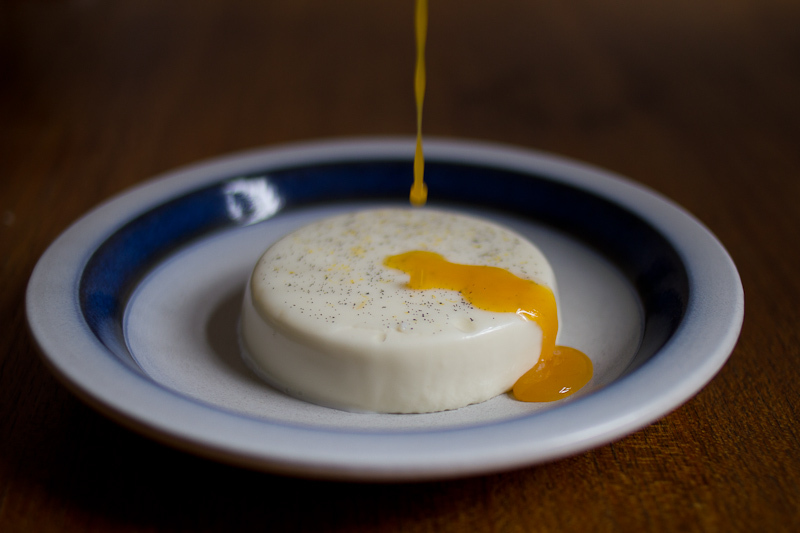 Panna cotta is really the perfect canvas. 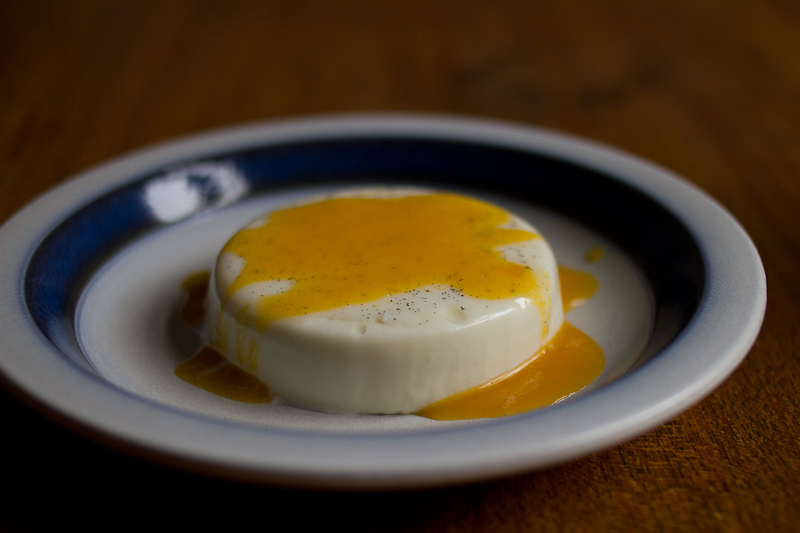 Desserts with gelatin are somewhat scary since you don’t know if they’ve worked and set until hours later, but the texture of this panna cotta is divine and it comes together without a hitch. Put three tablespoons of cold water in a medium bowl and sprinkle with the gelatin. Set aside to soften. Lightly brush 8 ramekins with vegetable oil. Slice the piece of vanilla bean and scrape out the seeds. Add to a saucepan with the milk, cream, sugar and lemon zest. Bring to a simmer over medium low heat. Remove the pan from the heat and let the mixture cool to about 130 F, about the temperature of hot water from the tap. Pour about 1/2 of the hot cream mixture over the gelatin. Stir until the gelatin is fully dissolved. 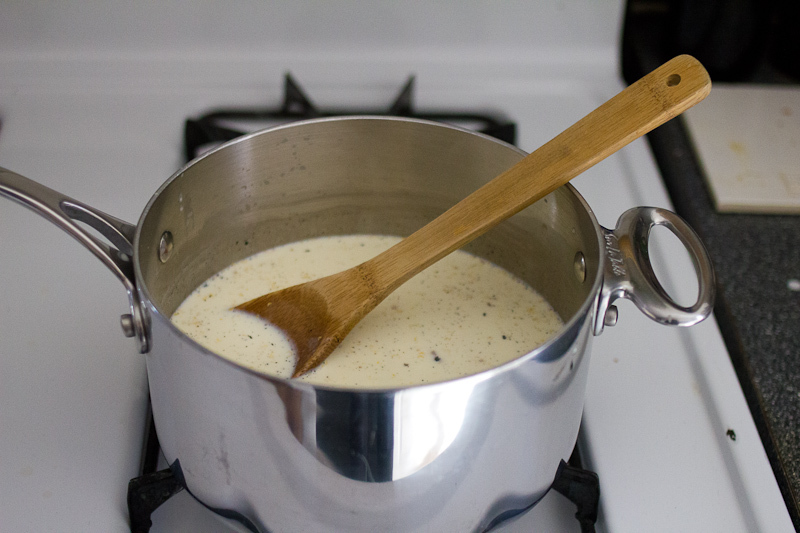 Pour back into the cream mixture and stir well. Strain through a mesh strainer into a bowl. Fill the ramekins and let chill for four hours or overnight. To remove from the ramekin, run a knife around the edges and turn upside down onto a plate. 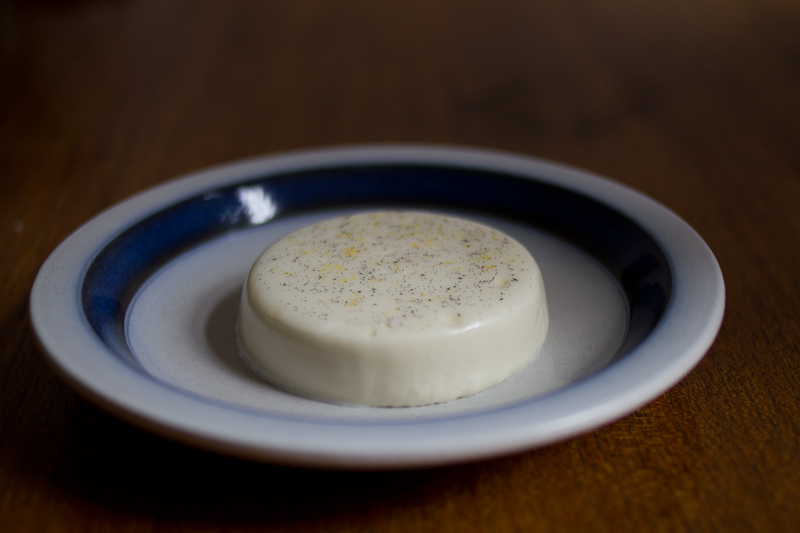 You can also dip the ramekins in hot water to loosen the panna cotta from the mold. Serve with several spoonfuls of passionfruit syrup over the top, or substitute passionfruit for grapefruit supremes, strawberries or peaches. Put the passionfruit puree in a saucepan and warm to liquify. Once liquified, stir in the sugar and warm just to dissolve the sugar. 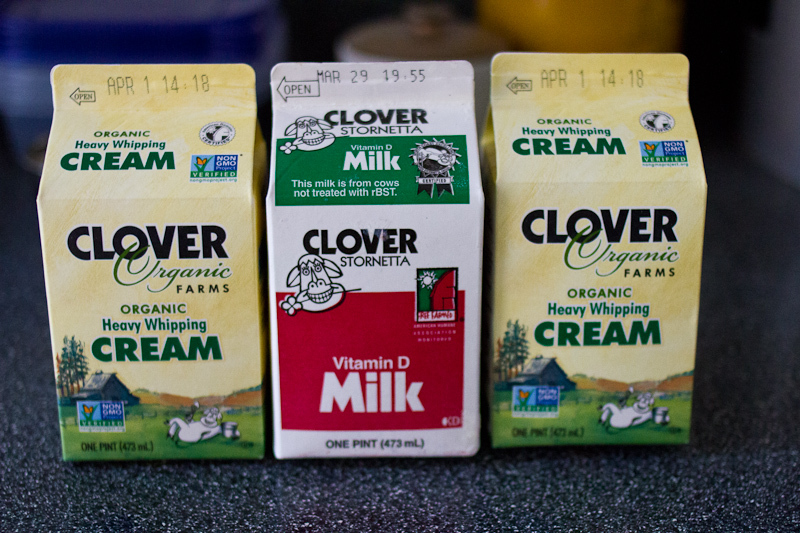 Pour into a glass jar and store in the fridge. 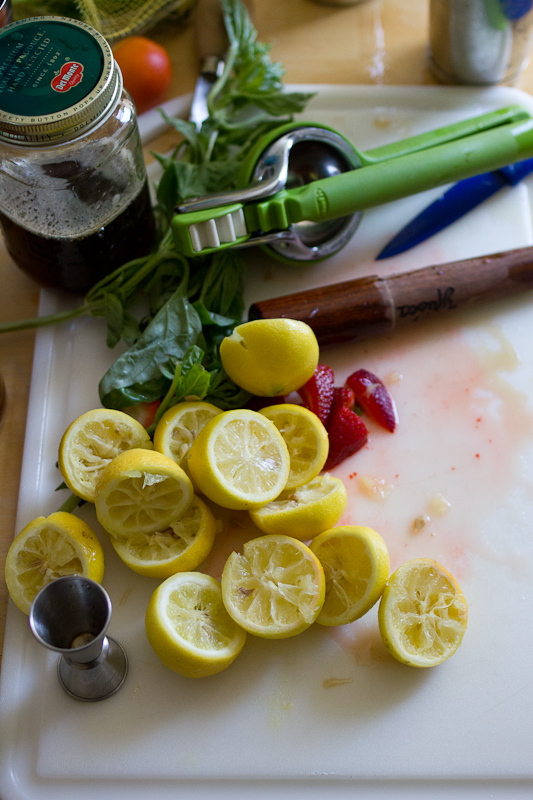 Use on panna cotta, yogurt, ice cream, or add to smoothies or sparkling water. It will keep 2 weeks in the fridge, but trust me, it won’t last that long. *We get our passionfruit puree at Evergreen Market, a market specializing in South American foods in the Mission. 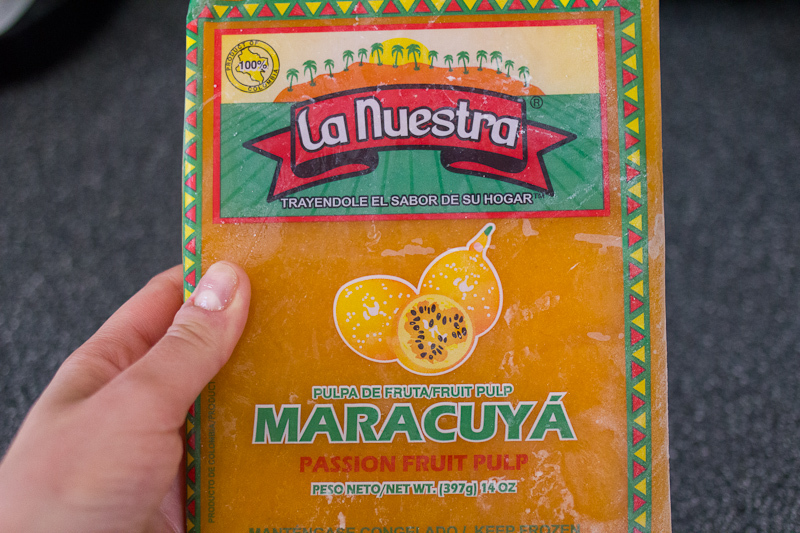 Check in the freezer section of your favorite Latin market for pulpa de fruta maracuyá. Good chances are you can secure some and change your life forever. 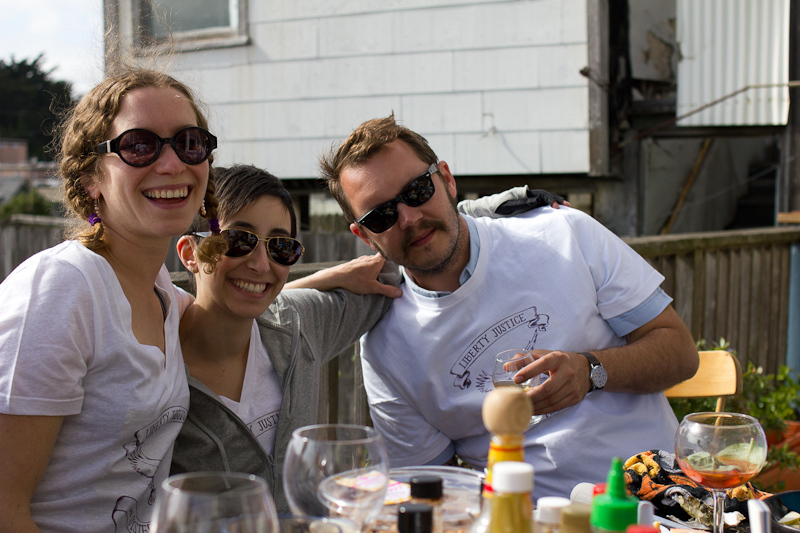 Yesterday we celebrated our third annual Oysterfest. 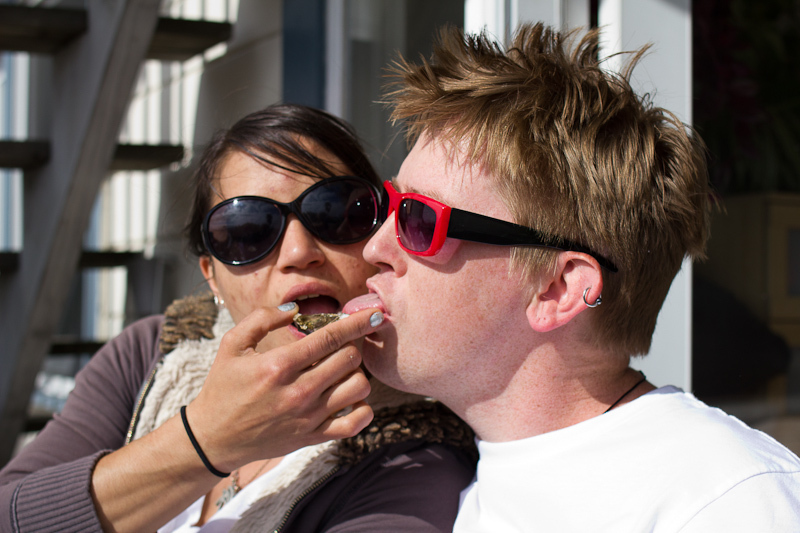 It’s a special thing when the stars align to bring together group of people whose shared love of raw mollusks is so steadfast that they are compelled to purchase 200 oysters and eat them all, sitting on a back porch in the San Francisco sunshine*. To repeat this celebration of the ocean’s bounty on the regular, now that’s how you know you’ve stumbled upon an exceptional group of folks—25+ oysters a person is nothing to scoff at. It’s on days like Oysterfest that I can’t believe my luck. To live in this beautiful city with such wonderful friends and exceptional food, I’m living the dream. 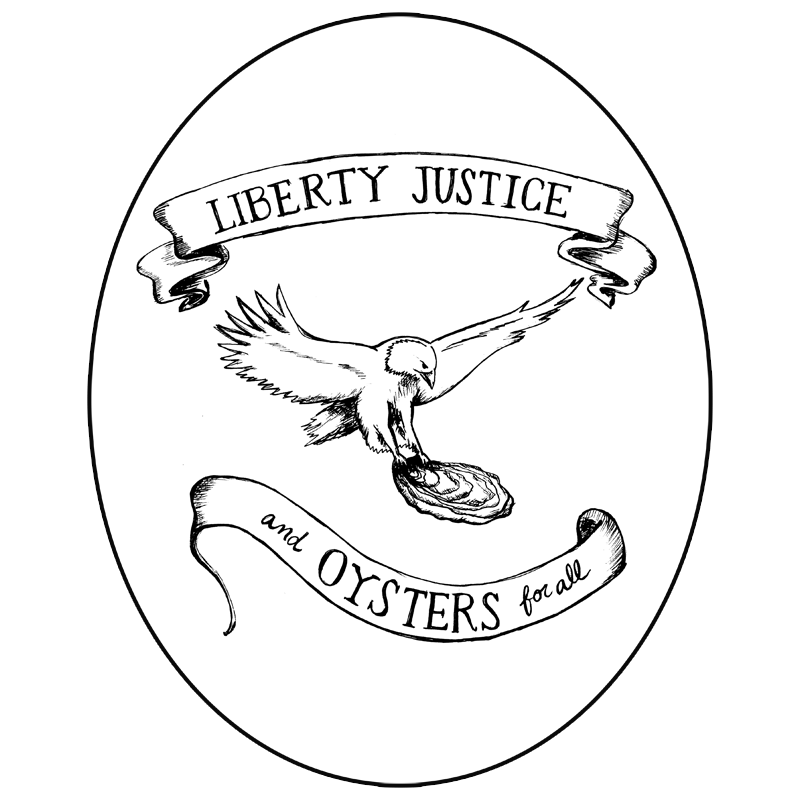 If you happen to have a group of friends similarly dedicated to the celebration of oysters and live in the Bay Area, it is easy (and surprisingly affordable) to secure a few bushels of oysters for your enjoyment at the Alemany Farmer’s Market from Point Reyes Oyster Company. 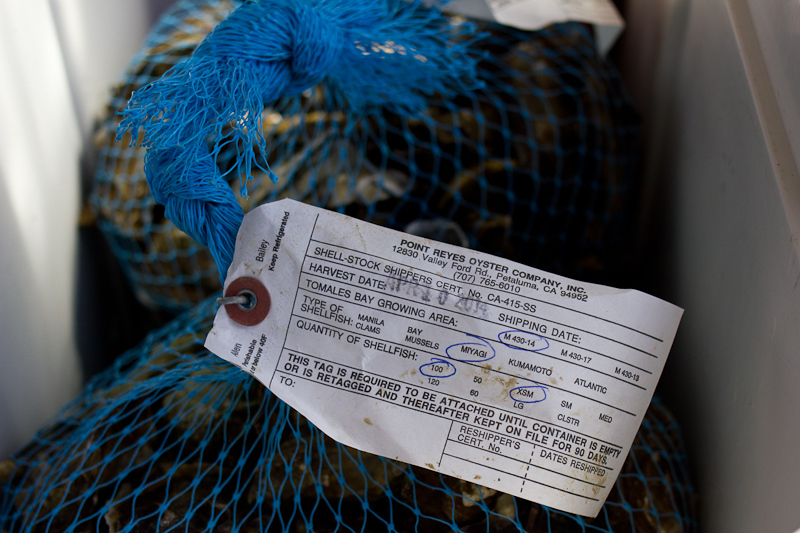 Throw your bushels of oysters in a cooler, pour a few bags of ice on top, and get ready to shuck. 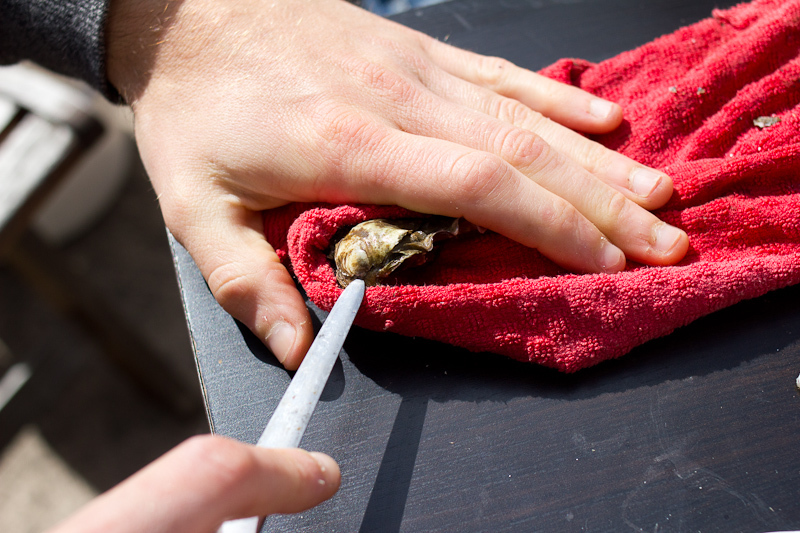 The best way to shuck an oyster (and minimize the amount of shell shrapnel you ingest) is to insert the tip of the oyster knife in the hinge of the oyster, apply firm pressure downwards at a 45 degree angle until the knife tip goes into the oyster and the oyster releases the suction holding it’s shell shut. 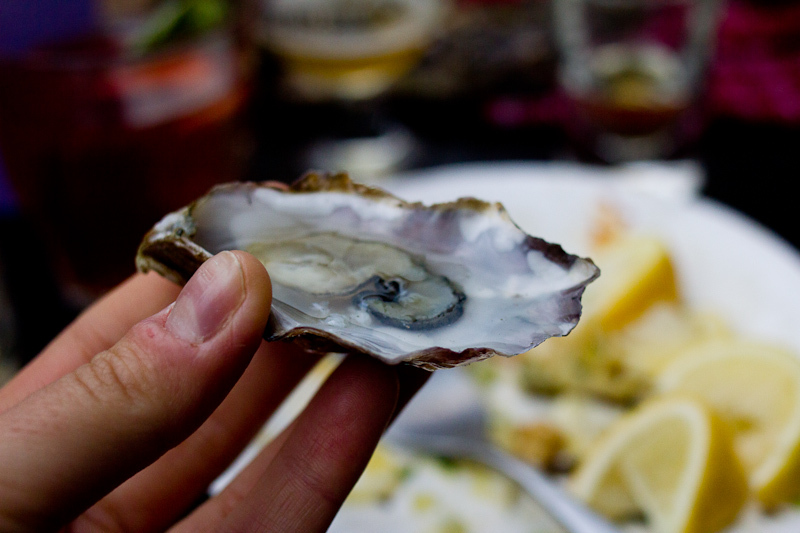 The two halves of its shell will loosen and you can more easily run your knife around the edges to free the oyster from the shell. 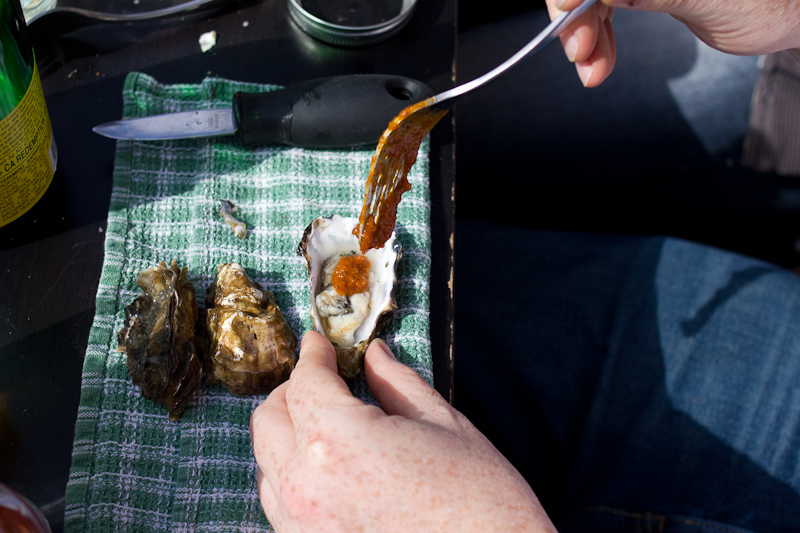 Detach the oyster foot from the shell, apply your condiments and enjoy! In a small bowl or jar, mix together the shallot, vinegar and salt and pepper. Let sit for the flavors to combine. 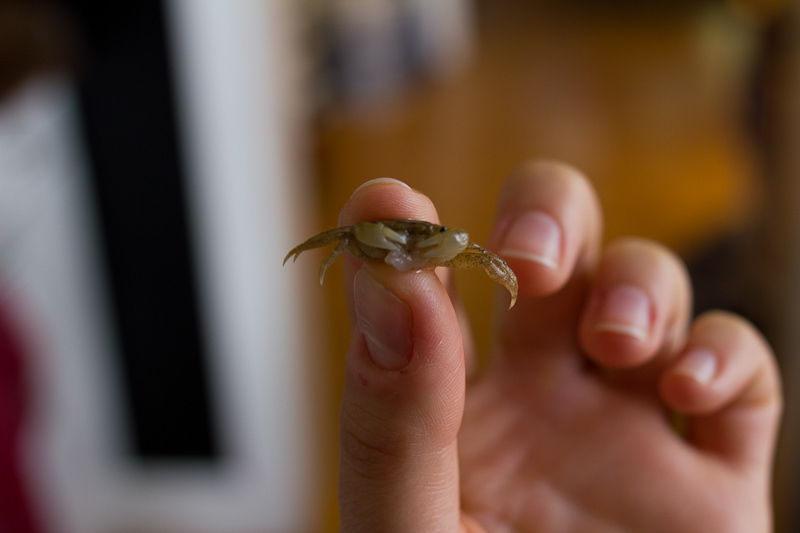 Serve a small spoonful over a raw oyster. For the lapsang simple syrup, make 2 cups strong lapsang tea and mix with 2 cups turbinado sugar. Stir to dissolve and keep refrigerated. In a cocktail shaker, place sliced strawberries, lemon juice, simple syrup and basil leaves (slapped). Muddle. Add whiskey. Fill shaker with ice and shake vigorously for 8 – 10 seconds. Double strain into an old fashioned glass. 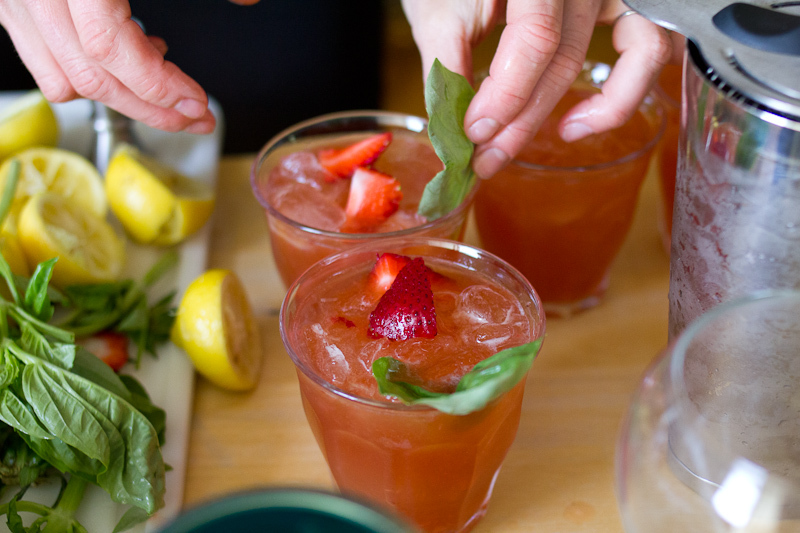 Garnish with sliced strawberries and a slapped basil leaf. 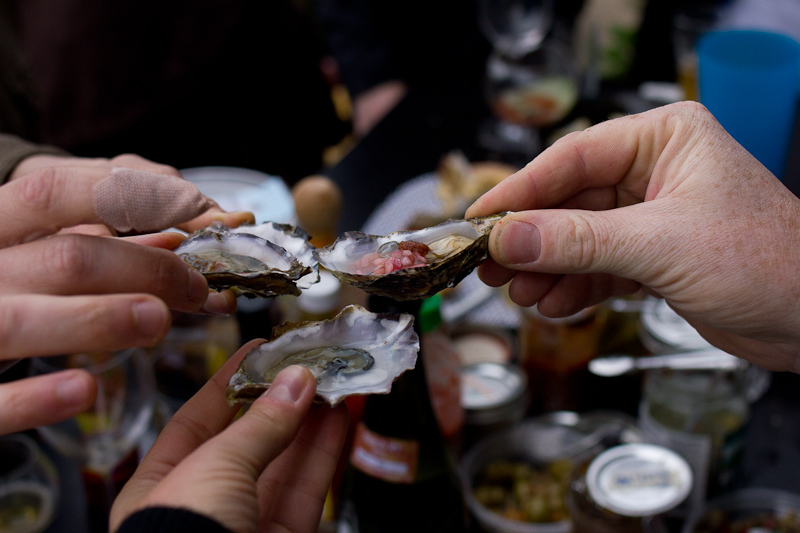 So make yourself a cocktail, grab an oyster knife and shuck your friend an oyster … or twenty. *The day usually starts off sunny and 65° F, but come 4 pm, the fog is rolling in thick and it’s time to bust out the jackets and blankets. Ps. 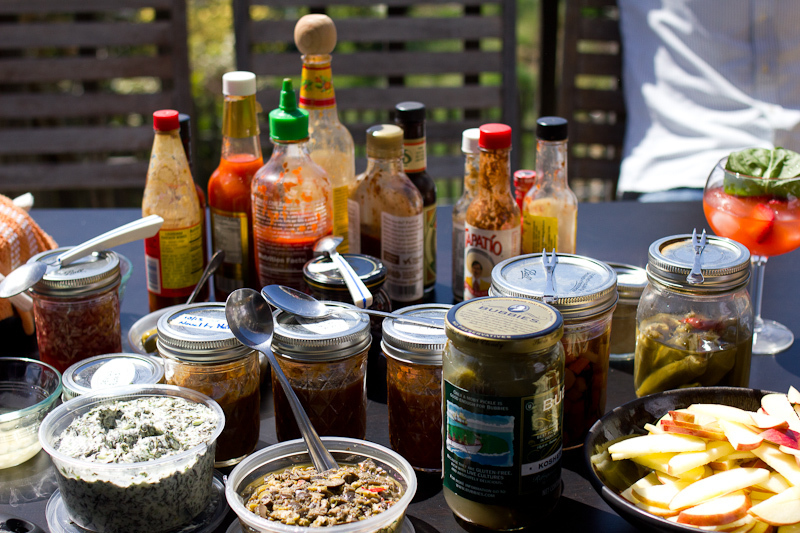 Last year’s Oysterfest and several phenomenal hot sauce recipes to accompany your oysters. Spring is here and so are the asparagus! 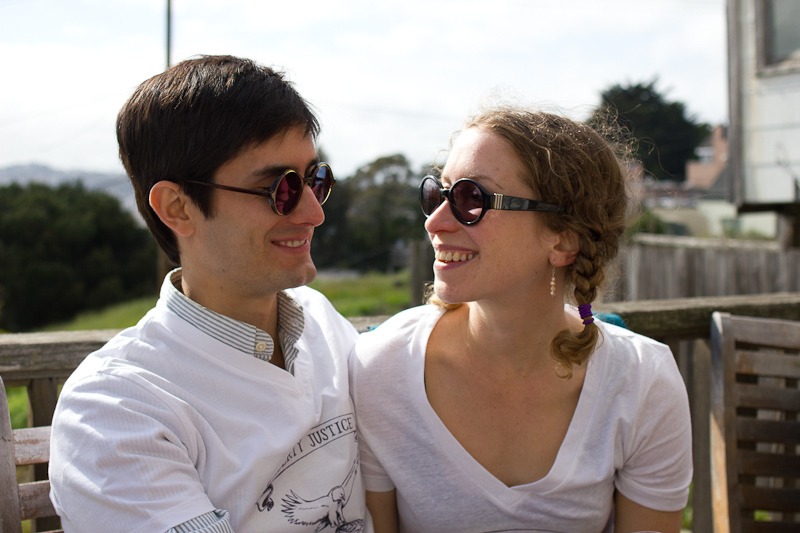 Though we really didn’t experience much in the way of winter this year in SF, I still can’t help but be happy it’s spring. 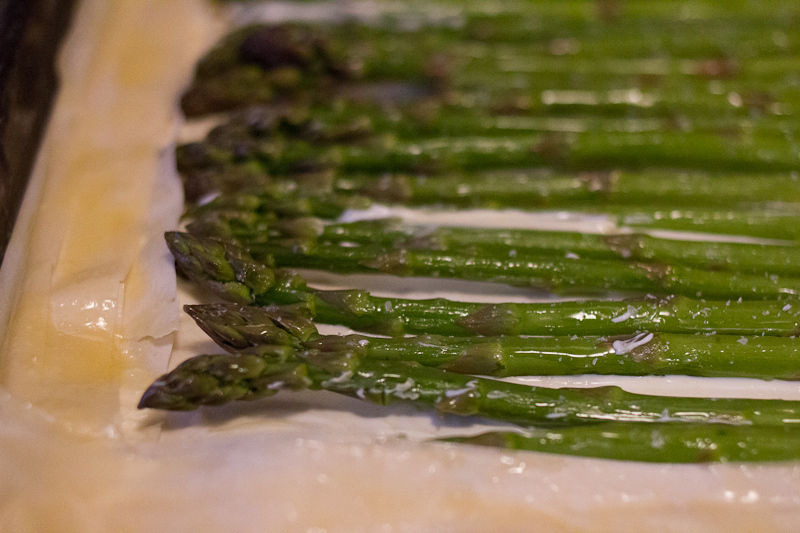 The other night we had the most heavenly asparagus at our friends’ house. Among their many talents, Russ and Kelly have an impressive green thumb. They have a garden plot near their place in Potrero Hill and we were lucky enough to sample some of their freshly harvested asparagus. 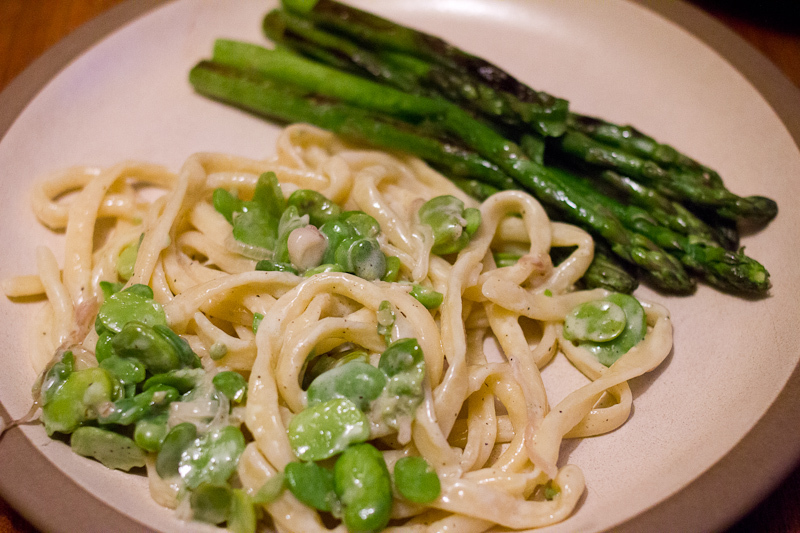 Sweet Demeter, it was the best asparagus of my life, and I couldn’t wait to get my hands on some more. So on Sunday before Jordan headed out for work, we went down the Civic Center Farmers Market and picked up two beautiful bunches of asparagus. While these weren’t quite the caliber of Russ and Kelly’s, I was still pretty pleased. Hurray for spring! 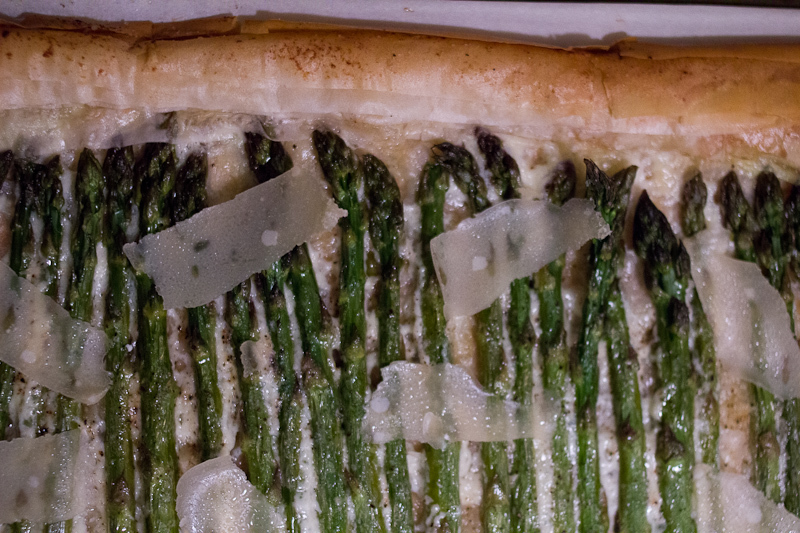 Hurray for asparagus! I decided to turn one of the bunches into a simple tart. The inspiration was from an old issue of Sunset magazine—a phyllo and tomato ‘pizza’ that I used to make at my mom’s house in the summers, but hadn’t made in years. 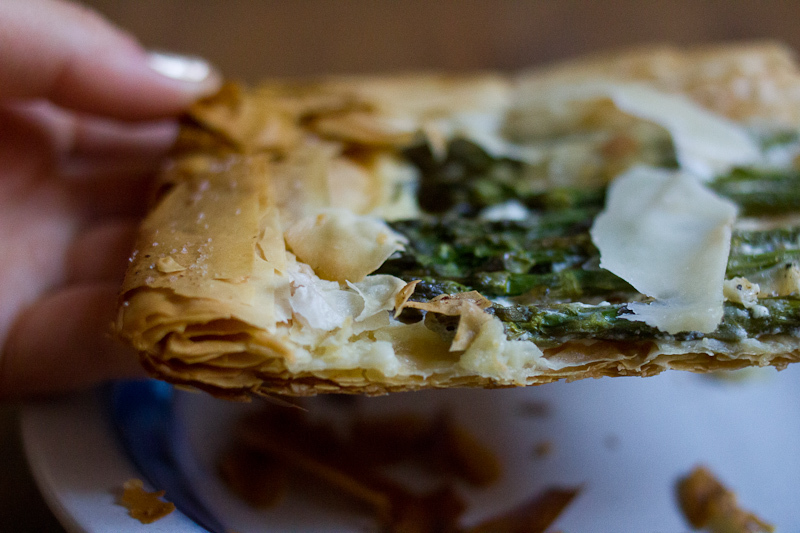 I had some phyllo sitting in the freezer from another so-so experiment, and so this was a snap to throw together. It takes about 10 minutes to assemble, about 20 bake and then you’ve got a beautiful tart to show for your efforts. For a crust that is almost no work, this one is deliciously flaky and satisfying. And, bonus fun fact, phyllo dough is vegan … until you slather it in butter. Easy, fresh and delicious! Preheat your oven to 425° F. Line a baking sheet with parchment paper. Wash and pat your asparagus dry. In a small dish, melt the butter. Spread one sheet of phyllo dough on the baking sheet. Brush the entire sheet lightly with butter. Top with another sheet of phyllo. Continue brushing with butter and layering with the rest of the sheets. Once you’ve stacked the phyllo, spread an even layer of creme fraiche in the middle of the dough, leaving a 1 1/2″ border along the sides. Arrange the asparagus evenly in a row. 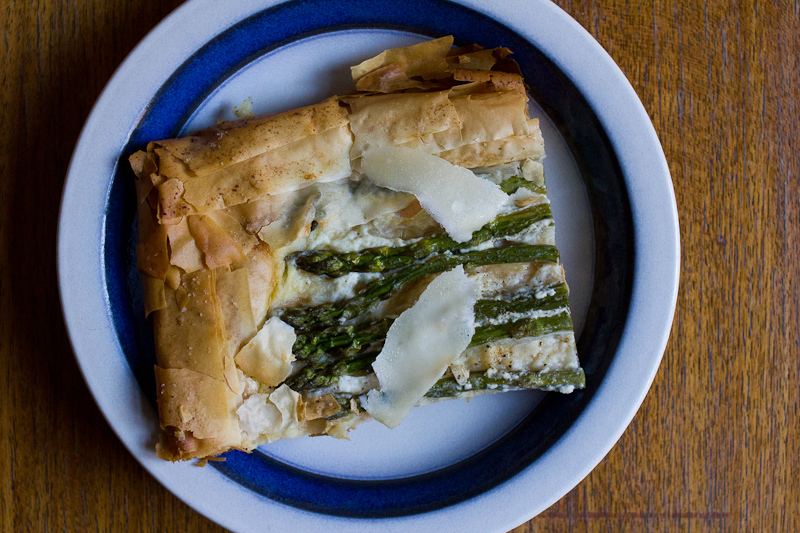 Fold the phyllo dough up around the asparagus and brush the border with the remaining butter. Sprinkle the asparagus with a little bit of salt. Bake the tart for 20 – 25 minutes, until the edges are golden brown. Remove from the oven and top with some black pepper and shaved parmesan. 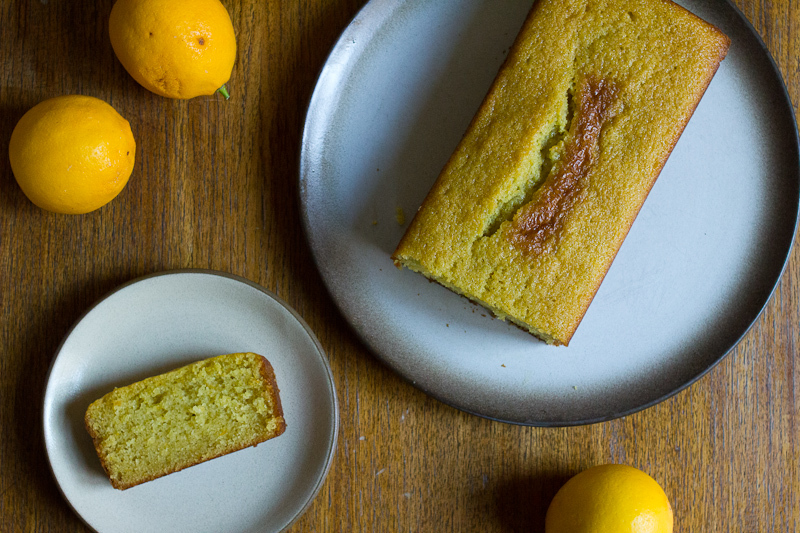 Add a squeeze of lemon if you’re feeling feisty. Ps. This op-ed about food and health by Mark Bittman from this week’s New York Times is fantastic. Butter is back, and all I can say is 1000 times YES. After reading through the recipe, I noticed that it called for Grand Marnier. For those who don’t know, Grand Marnier is an orange-flavored cognac liquor that while tasty, is also very expensive. Usually, I’d just skip the Grand Marnier and call it a day. But, I figured that I ought to embrace my duty as a food blogger and actually determine 1) if 1/4 cup of Grand Marnier makes a difference in taste and 2) if that extra cost actually makes the cake better. Testing ensued! 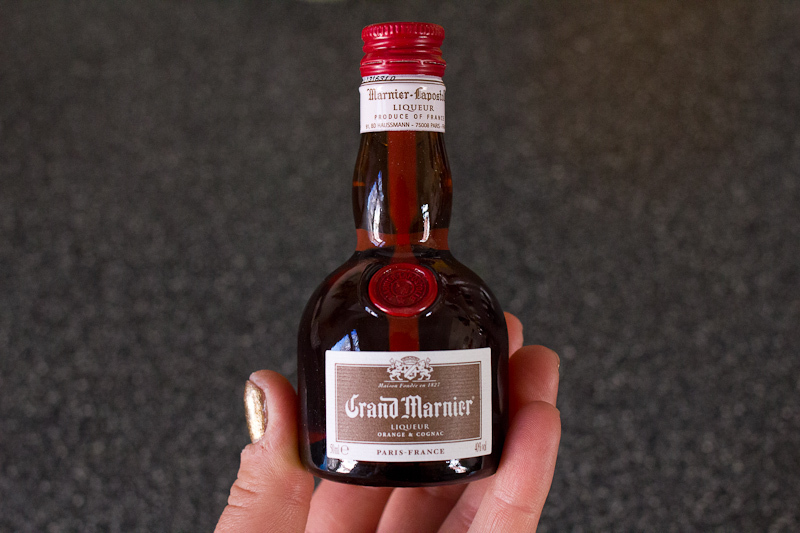 The Method: Firstly, you can purchase tiny, tiny bottles of Grand Marnier at BevMo for $5 (still spendy, but not terrible for the wealth of information it would provide). In the interest of scientific integrity, I made the batter as if I was making just one cake up until the very end and then separated it out into two bowls. To one bowl I added 1/8 cup Grand Marnier and to the other I added 1/8 cup citrus juice, taking care to stir them equally. I then poured them into the prepared baking dishes and baked them side by side for the same amount of time. The Findings: In a blind taste test, Jordan was able to correctly identify the cakes, but he also found both equally delicious. The Grand Marnier does indeed add a deeper, spicier, slightly boozy flavor, but the cake with just citrus juice was still really damn good. 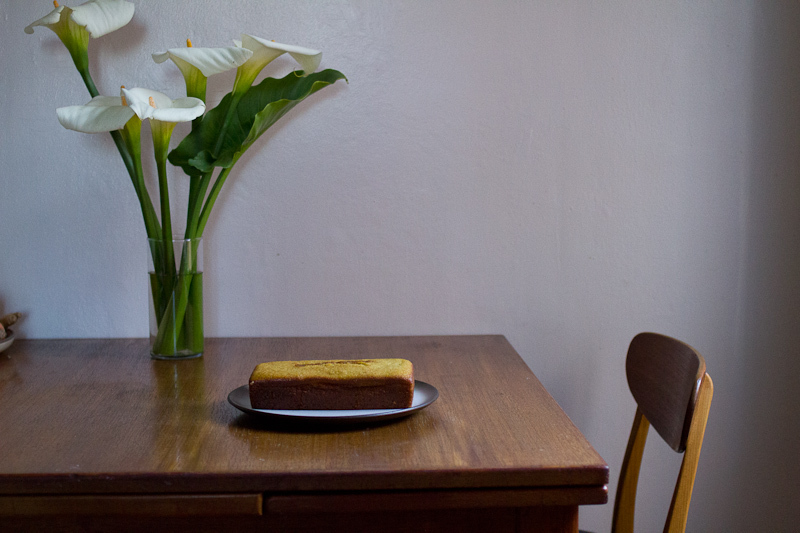 Strangely, the cake with the Grand Marnier also rose a bit more—the jury is still out on why. 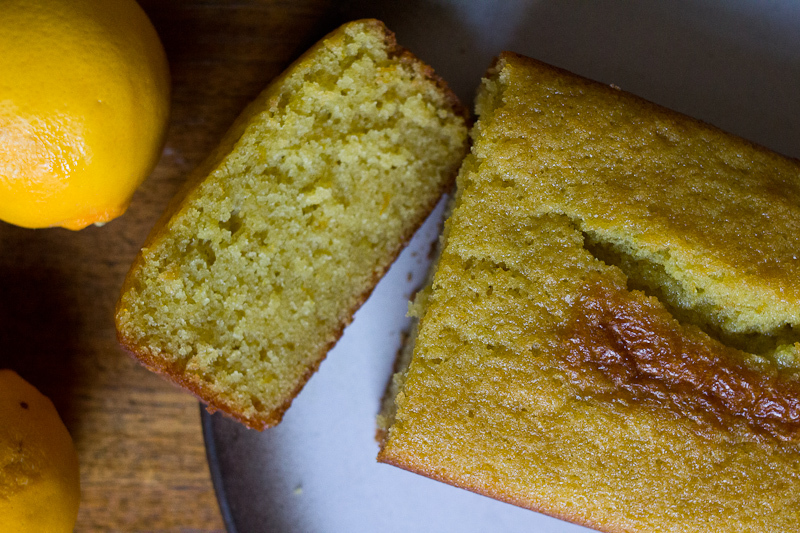 I slightly preferred the cake with Grand Marnier because it was a bit more complex with a more subtle citrus flavor, but honestly, don’t drop the cash on Grand Marnier if you don’t already have it lying around. If you do, by all means, throw it in. And bring me a cup in a mason jar. 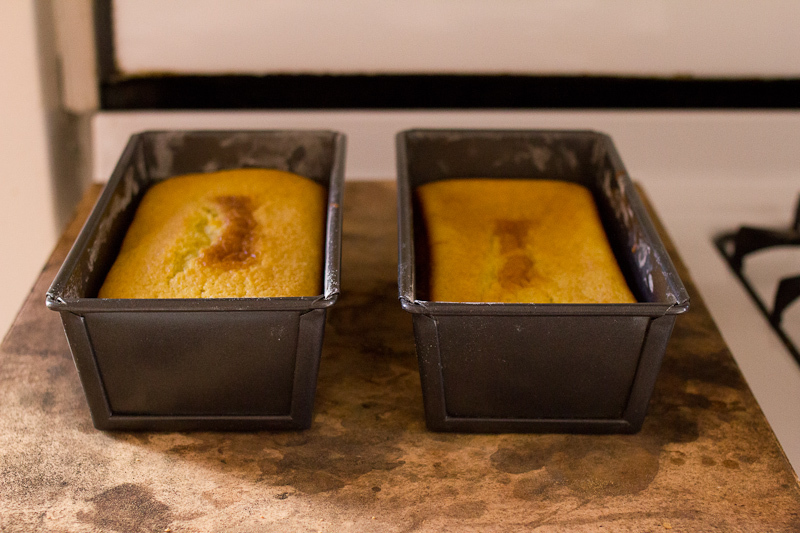 1/4 cup Grand MarnierPreheat the oven to 350° F. Butter and flour a 9 inch cake pan or two loaf pans. In a bowl, whisk together the flour, sugar, slat, baking soda and baking powder. In another bowl, whisk together the olive oil, milk, eggs, orange zest, orange juice and Grand Marnier (if using). Add the dry ingredients to the wet and stir until just combined. Pour into the prepared pans and bake for one hour, until the top is golden and a cake tester inserted into the center comes out clean. 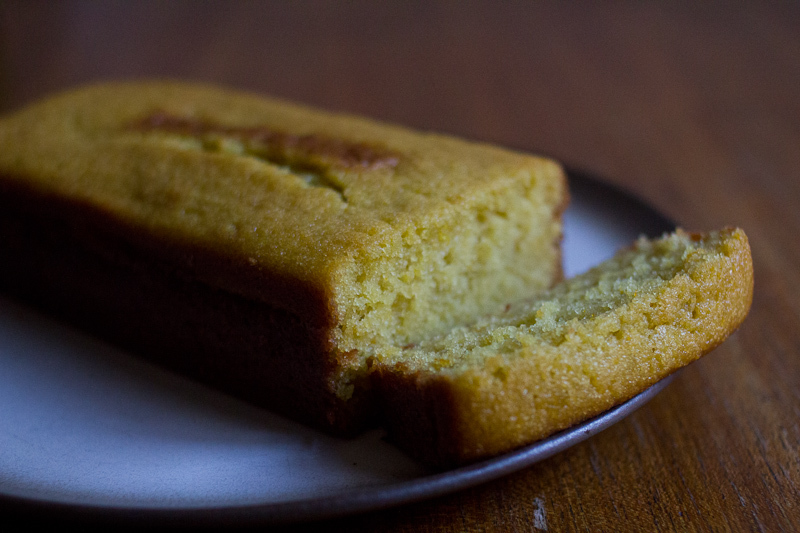 Let cool on a rack for 30 minutes and then run a knife around the edge and invert the cake onto a plate. Let cool for a few more hours if you can stand it. Enjoy for dessert (or for breakfast, I won’t hide from the truth).